Didelphis virginiana, the Virginia opossum, is the only extant marsupial that is native to North America. The Virginia opossum is a large didelphid; adult males average 2.8 kg and adult females average 1.9 kg (McManus, 1974). Adult D. virginiana are characterized by a long snout; a long, prehensile, scaly tail; short, black ears; long guard hair; and presence of an opposable and clawless halux of the pes. Pelage coloration varies across its geographic range (Gardner, 1973). Didelphis includes three species: D. virginiana, D. marsupialis (the southern opossum), and D. albiventris (the white-eared opossum). Together these three species form a clade that is most closely related to Philander, the gray and black 'four-eyed' opossums (Jansa and Voss, 2000; Voss and Jansa, 2003). This clade (Didelphis + Philander) is nested within a larger clade that includes Lutreolina, the thick-tailed opossum; Chironectes, the water opossum; and Metachirus, the brown 'four-eyed' opossum (Jansa and Voss, 2000; Voss and Jansa, 2003). All of these taxa are members of the exclusively New World clade Didelphidae, which is a basally diverging clade of Marsupialia (Horowitz and Sánchez-Villagra, 2003). Didelphis virginiana ranges from southern Canada to northwestern Costa Rica in Central America (Gardner, 1973). In the United States, D. virginiana is ubiquitous east of the Mississippi River and in the eastern portion of the Midwest. The Virginia opossum also occurs along the U.S. west coast and was introduced sporadically throughout the Great Plains, desert southwest, and Rocky Mountain states (Gardner, 1973). Didelphis marsupialis is restricted to Central and South America, and D. albiventris is found only in South America (Gardner, 1973). Didelphis virginiana first appears in the fossil record in the Pliocene of South America and is first seen in North America during the Pleistocene, having crossed the Panamanian land bridge during the Great American Interchange (McManus, 1974). Didelphis virginiana is mostly nocturnal and occupies a variety of habitats, but prefers wet areas of its distribution (McManus, 1974). Didelphis frequently refuges in abandoned burrows of other animals. The Virginian opossum mainly feeds on insects and carrion but also consumes fruits and seeds (McManus, 1974). It has relatively few natural predators, but is sometimes hunted for food by humans in the southern United States. 'Possum and sweet taters' is one common way that D. virginiana meat is prepared (Hartman, 1952). The skull of the Virginia opossum is characterized by a snout that is wider than the braincase and a pronounced sagittal crest. The dental formula for Didelphis virginiana (and all other didelphids) is i 5/4, c 1/1, p 3/3, m 4/4. There are five endoturbinals in the nasal capsule and the cranial cavity is characterized by large ethmoidal fossae and deep subarcuate fossae. Click on the thumbnails below for labeled images of the skull in standard anatomical views. This male specimen was collected from Travis Co., Texas. It was made available to The University of Texas High-Resolution X-ray CT Facility for scanning by Ted Macrini of The University of Texas at Austin courtesy of the Texas Memorial Museum Vertebrate Paleontology Laboratory. Funding for scanning was provided by a National Science Foundation dissertation improvement grant to Mr. Macrini. This specimen was scanned by Matthew Colbert on 9 February 2004 along the coronal axis for a total of 859 slices. Each slice is 0.132 mm thick, with an interslice spacing of 0.132 mm and a field of reconstruction of 61 mm. Coues, E. 1872. On the osteology and myology of Didelphis virginiana. Memoirs of the Boston Society of Natural History 2:41-154. Gardner, A. L. 1973. The systematics of the genus Didelphis (Marsupialia: Didelphidae) in North and Middle America. Special Publications of the Museum Texas Tech University 4:1-81. Hartman, C. G. 1952. Possums. University of Texas Press: Austin, Texas. 174 pp. Horowitz, I., and M. R. Sánchez-Villagra. 2003. A morphological analysis of marsupial mammal higher-level phylogenetic relationships. Cladistics 19:181-212. Jansa, S. A., and R. S. Voss. 2000. Phylogenetic studies on didelphid marsupials I. Introduction and preliminary results from nuclear IRBP gene sequences. Journal of Mammalian Evolution 7:43-77. McClain, J. A. 1939. The development of the auditory ossicles of the opossum (Didelphis virginiana). Journal of Morphology 64:211-265. McCrady, E. 1938. The embryology of the opossum. American Anatomical Memoirs 16:1-233. Nesslinger, C. L. 1956. Ossification centers and skeletal development in the postnatal Virginia opossum. Journal of Mammalogy 37:382-394. Toeplitz, C. 1920. Bau und entwicklung des Knorpelschädels von Didelphys marsupialis. Zoologica 27:1-84. Voss, R. S., and S. A. Jansa. 2003. Phylogenetic studies on didelphid marsupials II. Nonmolecular data and new IRBP sequences: separate and combined analyses of didelphine relationships with denser taxon sampling. Bulletin of the American Museum of Natural History 276:1-82. Weil, R. 1899. Development of the ossicula audita in the opossum. Annals of the New York Academy of Sciences 12:103-113. 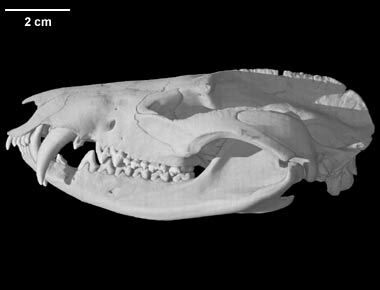 Click on the thumbnail to the left for a pitch animation (1.2 mb) of the isolated Didelphis cranial endocast. Click on the thumbnail to the left for a roll animation (2.5 mb) of the Didelphis cranial endocast highlighted in red within the skull, which is rendered semi-transparent. Click on the thumbnail to the left for a roll animation (1.6 mb) of the isolated Didelphis cranial endocast. Click on the thumbnail to the left for a pitch animation (1.5 mb) of the Didelphis interior nasal skeleton. Click on the thumbnail to the left for a roll animation (2.0 mb) of the Didelphis interior nasal skeleton. Click on the thumbnail to the left for a pitch animation (1.4 mb) of the Didelphis interior nasal skeleton. To cite this page: Dr. Ted Macrini, 2005, "Didelphis virginiana" (On-line), Digital Morphology. Accessed April 25, 2019 at http://digimorph.org/specimens/Didelphis_virginiana/.